With its five masts and 42 sails, Royal Clipper, influenced by the 1902 German Preussen, is the largest in the Star Clipper fleet and the fastest sailing ship in the world. Once on board, explore one of the hidden balconies, climb the mast for endless crow’s nest views and wander around the indoor three-deck atrium. 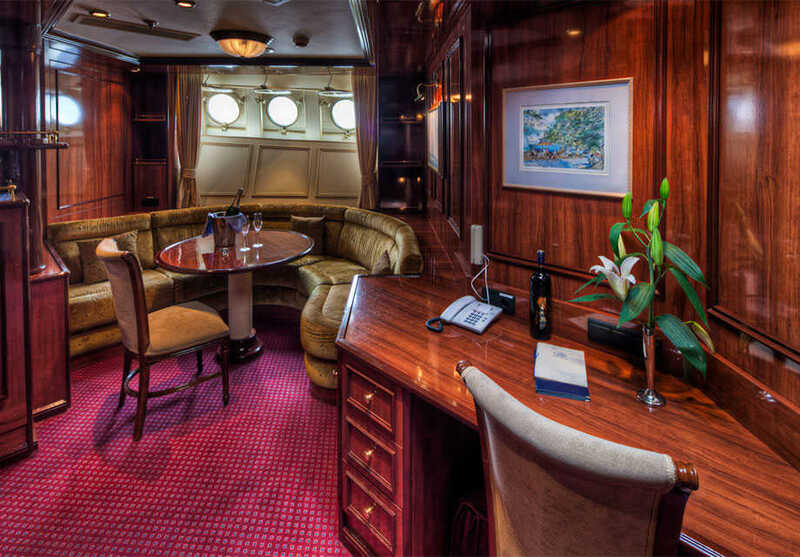 Other areas to take in the views or socialise include the observation lounge, library, spa & health club or you could take a peep through submerged portholes in the Captain Nemo Lounge. Useful things to know when it comes to dining. Feel rejuvenated and radiate health and beauty with the onboard spa and wellness options. There's plenty to see and do for leisure time, just take a look at what's on offer. Enjoy great entertainment options with plenty to see, do and applaud. 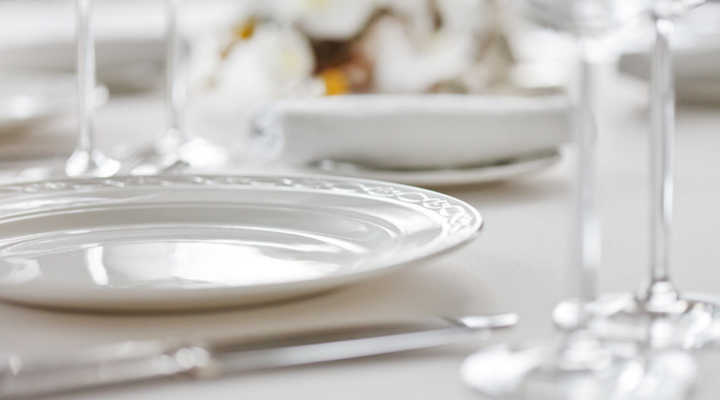 Enjoy fantastic cuisine, lovingly prepared and varied, in the dining room with its unreserved seating and easy-going dress code, guaranteeing relaxation. Serves breakfast, lunch and dinner. Menus change daily – nut free & healthy eating dishes are available on request. With underwater portholes, this is also the site for the spa and health club where you can enjoy pure service and relaxation. Indoor/outdoor bar on the Main Deck with its own nightly entertainment programme. Once per cruise, weather permitting, lunch is served here. In addition, nothing-fancy cocktail-hour snacks are set out daily. Comfortable, spacious place to enjoy teas, coffees and multiple daily piano concerts in an inspiring and welcoming atmosphere. Comfortable Edwardian style library, perfect for relaxing with a game of bridge, backgammon or chess. Star Clipper's dedicated watersports staff are on-hand to introduce you to lots of great activities including kayaking, paddle-boarding, banana boating, water skiing and windsurfing. Climb high above the deck to the lookout station at the first yardarm on a ship mast. 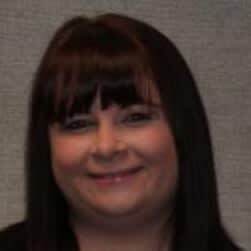 This may sound dangerous but don’t worry you’ll be supplied with a safety vest tethered to a watchful crew member who makes sure everything is secure as you move up the ratline. You can even chill for a bit on a comfortable teak settee where you can gaze out over the horizon or peer down at your fellow travellers 60 feet below. What better way to spend large parts of your cruise holiday than relaxing and resting in the spa. A fitness centre, unisex hair salon, massage room and the Skin and Body Treatment Center are also located in this area. 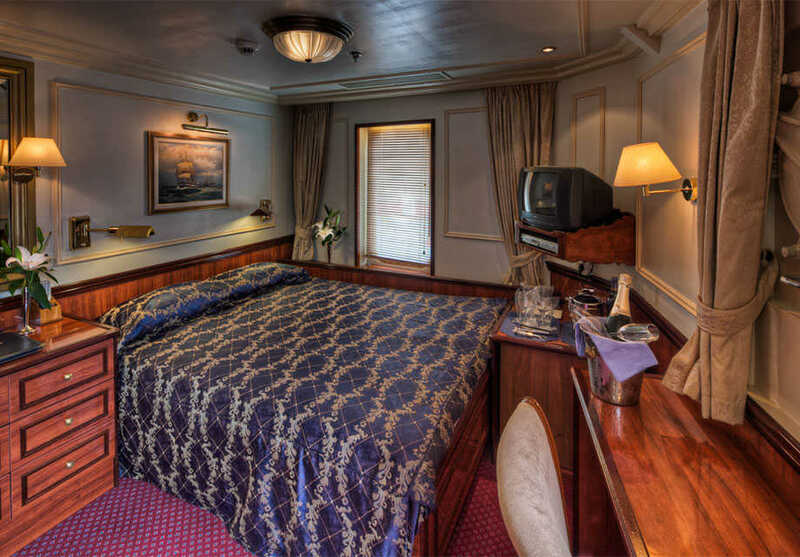 Enjoy charming cabins of various styles, all with yacht-like decor and comfort. Cabin doors open onto the main deck and the bathroom features a whirlpool tub. This Main deck deluxe outside suite has a private veranda, a sitting area and bathroom with a whirlpool tub. 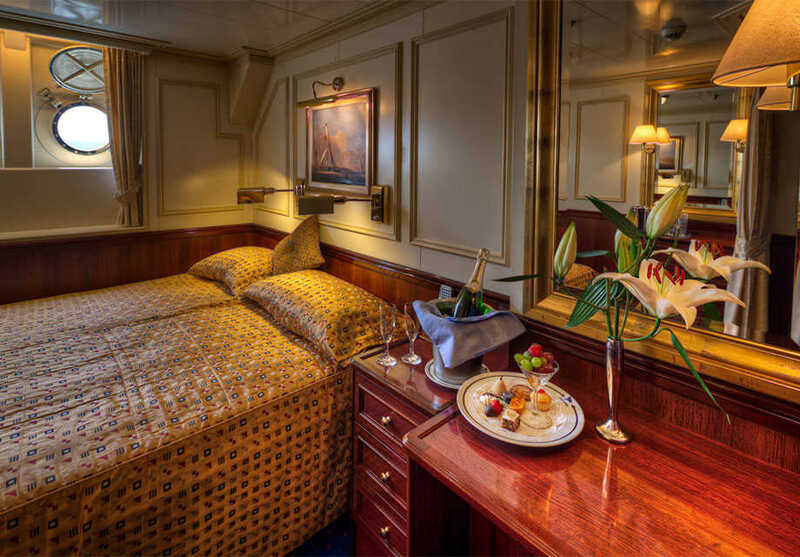 Clipper deck luxury outside suite with two double beds and a separate sitting area; the bathroom is well-equipped and includes a whirlpool tub. 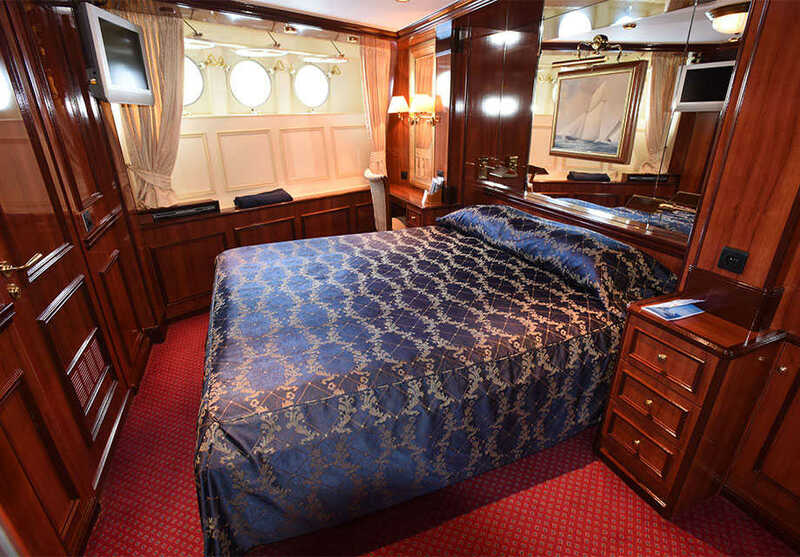 Situated on the Clipper deck this outside cabin offers a choice of sleeping configurations. Outside cabin situated on the Clipper or Commodore decks. A compact outside cabin situated on the Commodore deck. 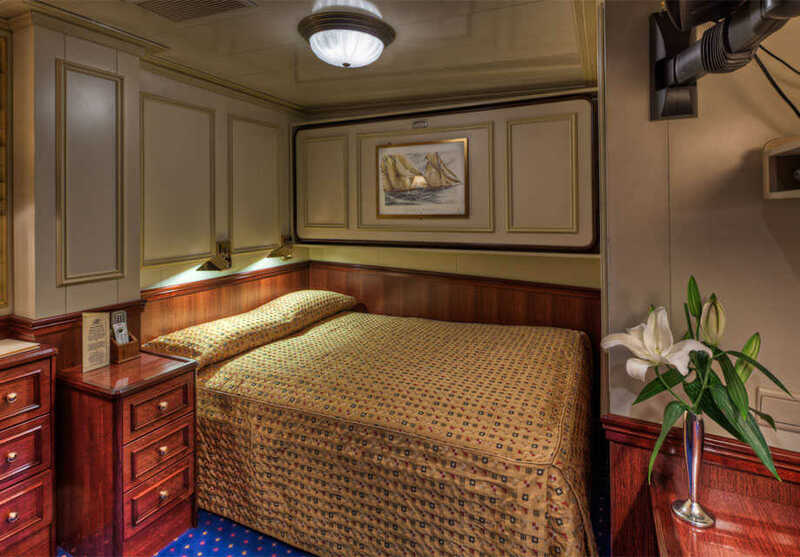 A compact inside cabin situated on the Clipper deck.